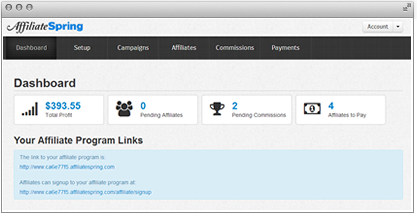 AffiliateSpring: The most afforable and easiest to use affiliate marketing software ever. After being discouraged by existing affiliate software that was overly complicated, we built AffiliateSpring to be as intuitive and easy to use as possible. AffiliateSpring gives you the features you need without getting in your way and slowing you down. Create your affiliate program in minutes and integrate with your existing shopping cart or e-commerce software in less than an hour. But don't worry, we won't tell your boss it was that fast if you want to spend a little extra time surfing the internet or grabbing a cup of coffee. Simply copy and paste our code snippets into your website or use our API to record commissions and other actions. 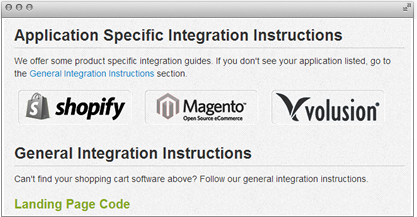 We give you instructions to integrate with your favorite shopping cart or e-commerce software including Shopify, Magento, Volusion and BigCommerce. And yes, the instructions come with pretty pictures. Feeling intimidated about affiliate marketing? Don't worry, we've got your back. We incorporate the best practices in affiliate marketing into our software and give you the knowledge you need to be successful. Even if you know nothing about setting up and running an affiliate program, you'll feel like a champion with AffiliateSpring. We provide the knowledge to successfully run your affiliate program on your own or let our experts run it for you with one of our dedicated affiliate managers so you can focus your time on what you do best. Let us take care of affiliate approval, monitoring, support and commission payments. With AffiliateSpring all your inbound affiliate links point directly to your domain so you get all the “link juice,” helping your SEO. We take care of all the hosting so you're instantly setup and don't need to worry about maintenance or software updates. Your data is protected with 256 bit SSL encryption. Plus, you're free to take your affiliates and your program elsewhere at any time. They belong exclusively to you.